Baseball and apple pie. Laurel and Hardy. Laverne and Shirley. Batman and Robin. Ren and Stimpy. Some duos seem so natural that you can hardly utter one half of the phrase without the other. Barbecue grills and hamburgers have to be considered among them. Each summer, my favorite market sells hamburger patties stuffed with jalapeno peppers and Gouda cheese. For a budding foodie like me, they are addictively delicious. And even though they are made with ground sirloin, they are still a greasy treat I know I can only enjoy in moderation. 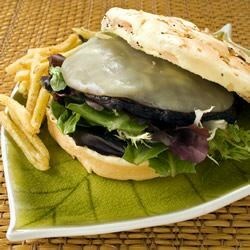 So I am always looking for a healthier alternative to the traditional burger for those times when I absolutely must put a burger on the grill. Here are two mouthwatering cookout suggestions that promise to taste great without derailing my improving eating habits. This recipe is via Allrecipes.com. Preheat an outdoor grill for medium-high heat, and lightly oil grate. Place the ground turkey, onion, cilantro, chipotle chile pepper, garlic powder, onion powder, seasoned salt, and black pepper in a mixing bowl; mix well. Form into 4 patties. Cook the hamburgers on the preheated grill until the turkey is no longer pink in the center, about 4 minutes per side. Place the mozzarella slices on the patties 2 minutes before they are ready. Serve on the toasted buns. Preheat grill for medium-high heat and brush grate with oil. Place mushrooms on the grill, reserving marinade for basting. Grill for 5 to 8 minutes on each side, or until tender. Brush with marinade frequently. Top with cheese during the last 2 minutes of grilling. Serve on your favorite bun. What’s your favorite way to shape up your slider?